This particular freebie goes along with the May 2014 edition of Math IS Real Life that will be live on 5/7/2014. Make sure to check out the link-up . . . feel free to join in too! 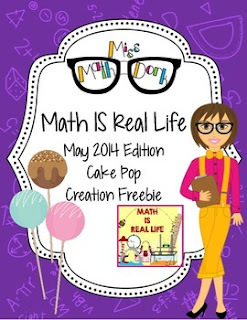 This freebie includes a real life cake pop creation scenario in which students will need to calculate what is a reasonable number of cake pops to make (based off of given information) and how much product will need to be purchased based off of their reasonable count. This activity was purposely left very open ended. Answer will vary. The point of the activity is less about getting the “correct answer” and more about working through the reasoning process. Make sure to check out the blog post for real pictures to use in your classroom.